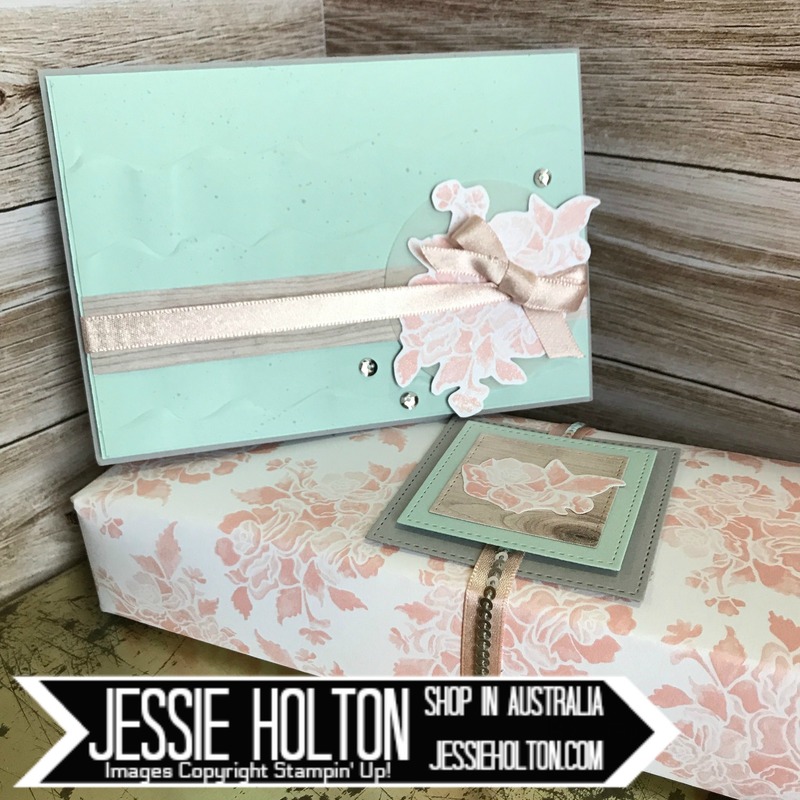 This month's OSAT Blog Hop is all about Very Vintage. 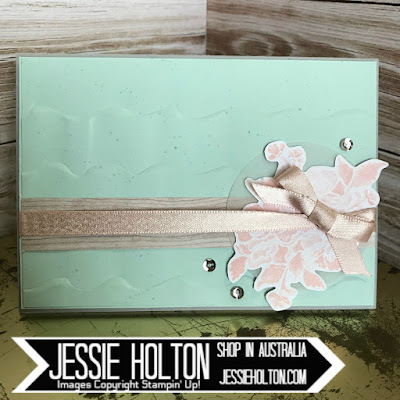 You may have come from the lovely Kelly Acheson's blog or you may be starting here at my blog. Either way, thank you for joining us & I hope you have fun hopping around this super fun theme! 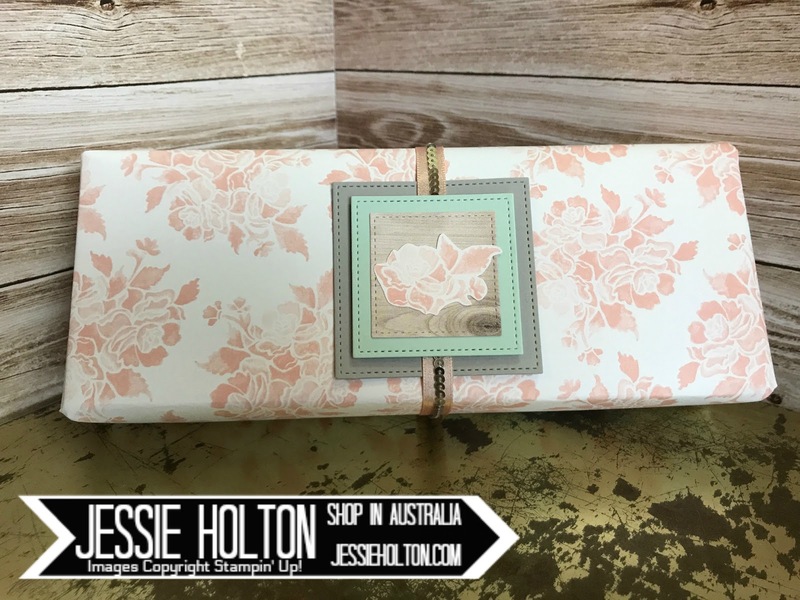 I originally imagined Crumb Cake, Sahara Sand,Vanilla Lace Trim & the big rose from the Birthday Blooms set, but this is what I ended up with. I hope you like it! I am so happy with this card & project, even though it's nothing like what I originally imagined haha! 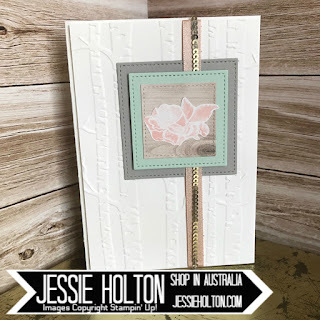 Smokey Slate, Soft Sky, Vellum & Powder Pink with a little of the blonde wood from the Wood Textures Designer Series Paper (DSP). 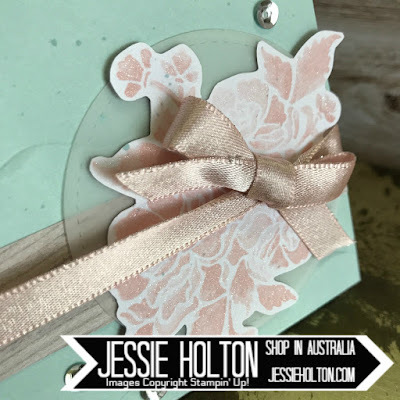 I have fussy cut the flowers from the Fresh Florals DSP Stack & added the new Powder Pink Shimmer Ribbon. The ribbon is gorgeous! It has the tiniest bit of metallic silver woven through it. I've added Silver Sequins to match the silver shimmer in the ribbon. 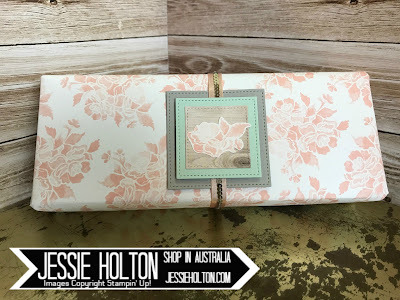 I've wrapped my parcel in the Fresh Florals DSP Stack; this is the paper I cut the flowers from for the tag & card. I've cut out the squares from the Stitched Shapes Framelits Dies on my Big Shot. There are Dimensionals between the Smokey Slate & Soft Sky layers & I've threaded the Powder Pink Shimmer Ribbon & the Silver Mini Sequin Trim through here. I've also used the Stitched Shapes Framelits Dies for the Vellum circle & added some of the silver sequins from the Metallic Sequin Assortment. I've just used a couple of Glue Dots to adhere the flowers to the Vellum & a couple more to adhere the Vellum to the card. You need to be careful which glue you use with Vellum as it marks really easily. The card looked too clean, so I added Clear Wink of Stella to my fussy cut flowers & splattered the card front with my Soft Sky Stampin' Write Marker. 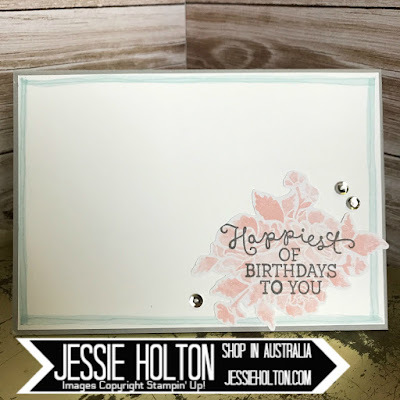 I have also used the Soft Sky Stampin' Write Marker to hand draw a double border around the inside layer of my card with the pen tip end & then I've gone over it with the brush tip end. 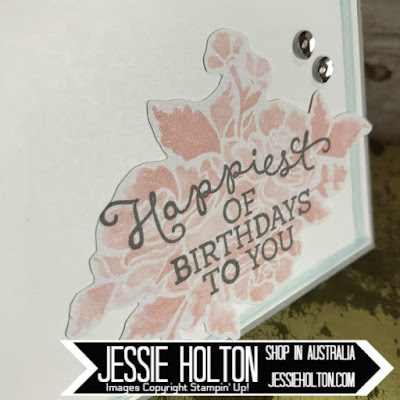 I have stamped the sentiment from the Birthday Blooms stamp set in Basic Grey on more fussy cut flowers, covered it with Clear Wink of Stella & added more sequins. Ok, now I'll level with you. The box I wrapped for my project had my new Brayer still inside haha! So I unwrapped it after the photo shoot & re-purposed the tag for this sweet card below. 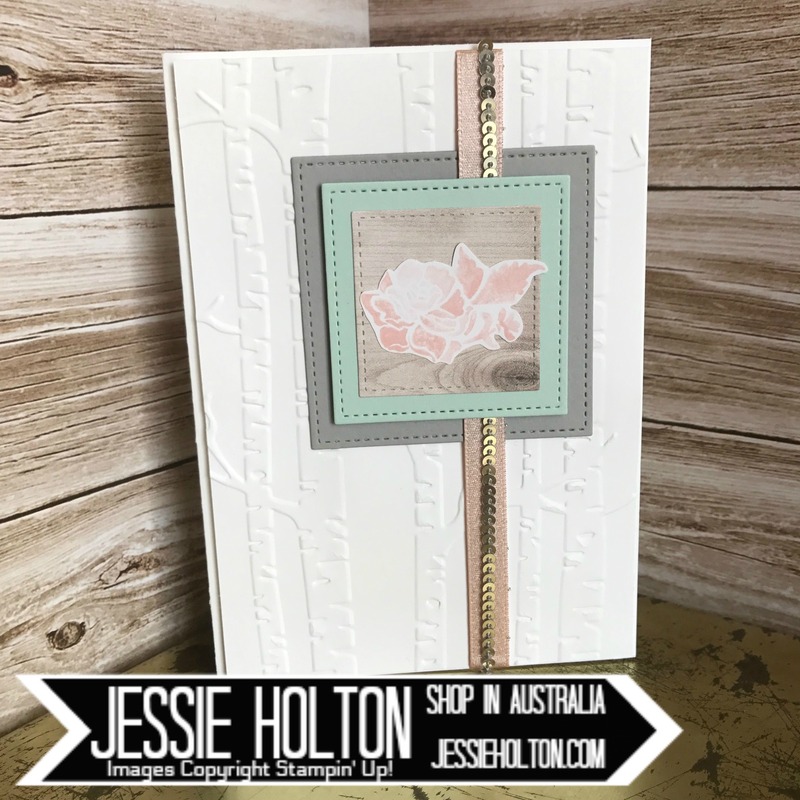 All I've done here is added a Whisper White layer run through the Big Shot with the Woodland Embossing Folder & how pretty is it!